From charming and approaching Compline to the newly opened First Street Napa, the neighborhood gets a modern update. 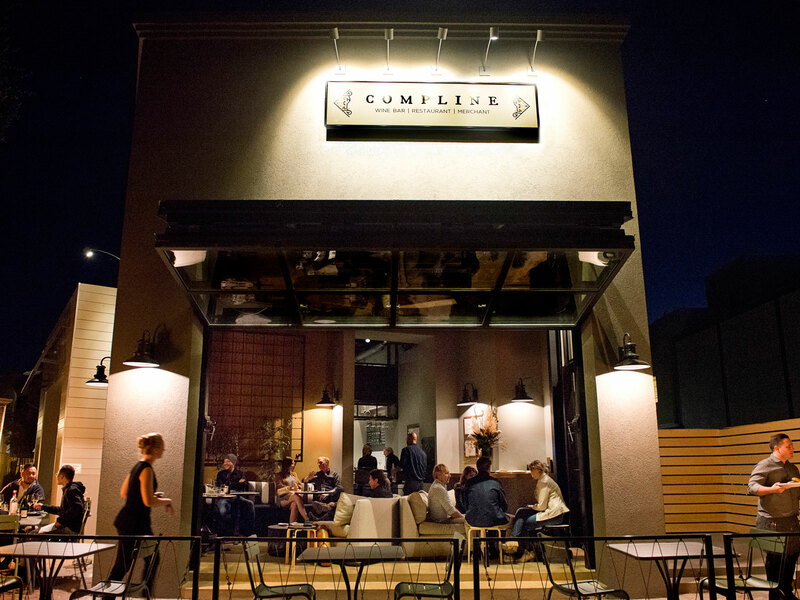 Ryan Stetins sat drinking bubbles and going through the books at Compline, the restaurant, bar, and retail spot that the former Charlie Trotter wine director opened last fall with Master Sommelier Matt Stamp, who made his name at the French Laundry. Napa producer Kivelstadt Cellars’ “Mother of Invention,” a luscious yet quaffable Marsanne-Roussane-Viognier blend, for all of $11 a glass on the wine list? Check. Viña Gravonia, Spain’s mushroom-meets-minerals white Rioja, for $33 a bottle on the wine bar’s front retail shelves? Check. The brisk, orange-blossom Domaine De Montbourgeau Cremant Du Jura for $30 retail, and Sonoma heavyweight Peay “Les Titans” Syrah for $98 on the list? Check and check. The Valley’s most exciting and reasonably priced place to sip wine was inventoried. But Stetins was only speaking metaphorically. We were nowhere near Beverly Hills. This was the Napa Valley, and we were sitting in a location that a few years back was a GNC vitamin store or a Site for Sore Eyes optometry shop or another old-school inhabitant of a failing outdoor mall in a drive-by town. That was before mogul Todd Zapolski took over this prime piece of real estate in downtown Napa and pumped $200 million into transforming it. The new development, First Street Napa, is a swank, urban-style shopping and dining mecca—the first of its kind in this farming Valley. It feels like a hip, new Napa, and that makes sense because the demographic of visitors and locals here is younger than you’d think. In 2016, the last time the local tourist board surveyed, a good 70 percent of visitors to Napa Valley turned out to be Gen Xers or Millenials. The largest age category of day trippers, representing more than a third, was between 20 and 34 years old. It’s the complement to the other hot shopping stop in the town, the indoor Oxbow Public Market, which is located down the street in a more residential area, and offers lots of culinary appeal. In a storefront location in First Street Napa’s anchor, the sleek Archer Hotel, I browsed the high-end housewares purveyor Mecox for vintage wooden Javanese bowls to use as showpieces on my dining table, unique French melted wine-bottle trivets, and the world’s boldest statement salad tongs. And I sipped through zinfandels at the Brown Estate Winery Tasting Room. Upstairs at the Archer’s sixth-floor Sky & Vine Rooftop Bar, a pal and I snacked on lobster corn dogs and tempura asparagus with pre-dinner cocktails to pair with the best, wraparound view of the Valley, from Carneros to Coomsville to Mount Veeder. Then we descended to the lobby to work our way through a pricey porterhouse of dinosaur proportions at Charlie Palmer Steak, along with a rich, spicy taste of Napa history in a 1997 Seavy Cabernet, courtesy of the restaurant’s nightly Coravin pour. Napastäk, Oxbow Market’s prepared foods specialist, is moving into First Street Napa soon, too. And there are more culinary arrivals on the horizon, says Zapolski, including a market-style experience with a big-named chef behind it. But the pièce-de-résistance is, and probably always will be, Compline, an affordable hangout where oeno-curious travelers can rub elbows with Valley up-and-comers—the assistant winemakers, the cellar rats—looking for maverick bottles (including some of their own upstart labels) and comforting food on their days off. Here, I sat eating a duck confit salad and sipping Young Inglewood “VENN,” a spot-on, old-school (read: elegant and not too big) Cali cab, while a kid not far out of college sat near me and earnestly asked the sommelier behind the bar, “If you were going to give your younger self the best advice about breaking into the wine world here, what would it be?” And the somm gave him a thoughtful and generous answer. It’s that kind of place. Archer Hotel: Of course there’s a wine fridge and a copy of Jancis Robinson’s 24-Hour Wine Expert in your room. Those, plus the Malin+Goetz products, the rooftop lounging pool, excellent local art, and lobby curio cases filled with Napa finds help make this a super-fun place to stay. Brown Estate Winery Tasting Room: Only wine club members can tour the estate, but any Napa visitor can make a reservation to sample the earthy zins, citrusy white blend, and maverick, flowery Charbono that this winery is pouring downtown. Charlie Palmer Steakhouse: The steaks are big, and the flavor’s bigger at the Napa location of this classic in the lobby of the Archer Hotel. The lounge that wraps the restaurant has fabulous happy hour deals. Compline: A 1996 Muscadet for $26 retail, anyone? No wonder Napa’s young vintners hang at this wine bar and shop: It offers a mind-bending selection at shockingly low prices. Chef Yancy Windsperger’s soul-satisfying fare (stone fruit salad; gnocchi vegetable bolognese) is designed to go with the marvelous sips. Mecox: From a spendy, crystal-ball-like acrylic ice bucket ($1,122) to $25 gold-key wine openers, there’s a culinary curio for everyone amid the beautiful selection at the First Street outlet of this high-end housewares purveyor. Sky & Vine Rooftop Bar: The Valley’s best view is all the more impressive with a Hendricks-and-pamplemousse sparkling cocktail in hand at this buzzy bar atop the Archer Hotel. Snacks—not to mention the bottomless buffet brunch— are courtesy of Charlie Palmer. Reverse happy hour pops from 9 p.m. to close.